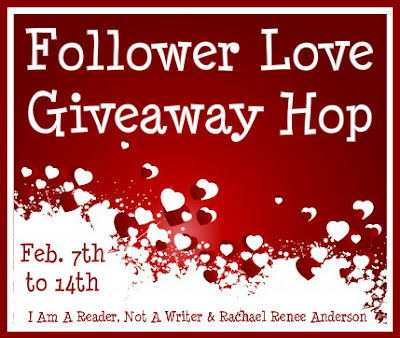 Welcome to the Follower Love Giveaway Hop. This hop is hosted by I Am A Reader, Not A Writer and is co-hosted by author Rachael Renee Anderson. After the jump, fill out the Rafflecopter to enter and then check out the linky, at the bottom of the page, for all the other great giveaways! looking forward to Fever and Divergent! whoo hoo. Thanks for the fun! Oh goodness, way to many! Throne of glass, Insurgent, Grave Mercy and Rebel Heart just to name a few. thanks for the awesome giveaway!! Oh wow...way too many to name but one I am looking forward to reading is Cinder. Thanks for the giveaway! I'm looking forward to reading The Selection by Kiera Cass. I don't know what one I'm most looking forward to! D: There are so many. But I think Immortal City is one I'm really lusting for right now. And Struck by Jennifer Bosworth. I'm really looking forward to Born Wicked. Thanks! I can't wait for Insurgent and Dustlands #2! I'm really looking forward to reading Born Wicked, Under the Never Sky and Everneath. I really want to read Born Wicked! OMFG WHAT AM I NOT LOOKING FORWARD TO?!?!?! Born Wicked sounds good... and Enchanted. And Partials... OMG SO MANY! I'm looking forward to everything! There are so many books, so little time! :D But one of the ones I'm looking forward to is Fever! Erm. Probably Sweet Evil, Masque of the Red Death, or Born Wicked. the 3rd book in the Lying game series of the second book in the Delidrium series. So many, but Pandemonium probably! Ohhh there are so many I'm looking forward to! I think Graffiti Moon (next week!!! ), The Selection and City of Lost Souls are my most anticipated. I'm looking forward to Born Wicked! SO MANY. Harbinger, The Selection, Embrace....AH. I'm really looking forward to Throne of Glass by Sarah J. Mass! Biting Cold by Chloe Neill! I can't wait for it!! Of course there are others, but I REALLY can't wait til it comes out!! Kin Harrison's latest Rachel Morgan book. That should be KIM Harrison. I'm looking forward to Dead to You by Lisa McMann. I've got a long list of 2012 debuts that I'm waiting to read. I'm really looking forward to Partials. I'm not sure if it's a debut but sdlfjksldkfslkd I can't wait to read it. I can't wait to read Incarnate. I have an ARC sitting on my shelf, but just haven't gotten to it yet. Thanks for the chance to win! I am really excited about The Selection. Ever since I read the summary I wanted it! Oh gosh. It's out already but it was probably Cinder by Marissa Meyer. Article 5 and Cinder! I can't wait! I am looking forward to so many books: YA is Article 5 and Adult is Fair Game. I love any kind of paranormal romance. I have not yet read Bloodlines, but will be soon, so I'll be looking forward to the sequeal and of course I'm waiting for Anita Blakes next story. I can't wait for Insurgent by Veronica Roth. Thanks for the giveaway! I love surprises. I'm looking forward to Michele Jaffe's Ghost Flower. HOURGLASS by Myra McEntire was my favorite book of 2011 so TIMEPIECE is my most looked foward to 2012 book. Ooh. Hard questions. I think probably Storybound by Marissa Burt. I can't wait for Shadow of Night by Deborah Harkness!!! I am most definitely looking forward to Insurgent by Veronica Roth! I'm really looking forward to Insurgent. I'm really excited for The Fine Art of Truth or Dare, and Pandemonium! Thanks for the giveaway! I'm dying for Before I Wake by Rachel Vincent, Dark Kiss by Michelle Rowen, and Pandemonium by Lauren Oliver. Thanks for the giveaway!! There are SO many to choose from... I would probably have to say The Statistical Probability of Love at First Sight. There are soo many I can't wait for but I really want Dreamless! Actually it already came out: Under the Never Sky. And i loved it! Well it WAS Cinder by marissa Meyer :) It rocked, Now I think its Incarnate by Jodie Meadows! Hmm, I was really looking forward to Cinder by Marissa Meyer but I've already read it so I' not counting it towards this. Let's see, I would have to say probably Incarnate by Jodie Meadows. I've heard nothing but good things from it. I can't wait to read Golden Lily by Richelle Mead and Girl of Nightmares (the 2nd Anna Dressed in Blood book). The selection by Kiera Cass. Also insurgent by veronica roth. I can't wait to read The Vanishing Game by Kate Kae Myers. so many books!! personally i can't wait for my life next door, born wicked, article 5, etc. too many!! I was most excited about Cinder by Marissa Meyer, which turned out to be a fantastic book. Now I'm really excited about Innocent Darkness by Suzanne Lazear. Looking forward to reading Cinder!! As well as Insurgent. i can't wait for the new Fallen, Hex Hall, and Goddess Test books! So many great sequels coming out this year! Thanks! I'm really looking forward to Struck by Jennifer Bosworth and Unraveling by Elizabeth Norris. The Golden Lily by Richelle Mead. Also the second book to Shatter Me by Tahereh Mafi. Thanks for this great giveaway! Born Wicked!! It sounds realllyy interesting!! Thanks for the giveaway!! I am looking forward to The Darkest Seduction by Gena Showalter. Born Wicked. It just sounds so good. Born Wicked. Been reading a lot of great things about it. I'm really looking forward to "Harbinger" and "Shadow & Bone" - they look awesome! I'm most looking forward to Insurgent, Pandemonium & Masque off the Red Death! I'm looking forward to Pandemonium. I'm excited to read "Fear" by Micheal Grant from the Gone series!! Cinder or Everneath sound good. Under the Never Sky looks good! Tiff Pull is my Rafflecopter name. I am the most excited for The Selection! I want to read Cinder. I don't even know if it will come out in 2012 but the next book in the series Seers by Heather Frost. I am looking forward to so many books. But- I would say Cinder and Born Wicked. Thanks so much for the giveaway and participating in the hop. J. Gabriel Gates Ghost Crown. I can't wait till it comes out! I am very much looking forward to A Perfect Blood by Kim Harrison. The Hollows series is one of my favorites! I'm most anticipating The Golden Lily by Richelle Mead. Fab giveaway! I can't wait for The Warrior by Margaret Mallory! Article 5, it sounds amazing. Hemlock by Kathleen Peacock is definitely one of the ones at the top of my list this year and Born Wicked. I'm looking forward to City of Lost Souls by Cassandra Clare. I've loved all the others in that series. Thank you for the giveaway. There are way too many good books coming out this year. Grave Mercy, Born Wicked, Hex Hall and so many more! Thanks so much for this giveaway! I'm looking forward to the catastrophic history of you and me and pandemonium most this year! I am almost finished with Delirium and I can't wait to read Pandemonium. This is awesome, Sarah, thanks so much! I don't know that I can pick ONE book that I'm most looking forward to, but I'm SUPER excited for Something Like Normal by Trish Doller. It looks amazing. There are so many that I'm looking forward to, but I think I'd have to go with When the Sea is Rising Red. I'm really looking forward to Golden Lily.